I have a confession to make: I’m not Irish. What….this surprises you?!??!!! OK, every year I share a little corn beef & cabbage with friends of Irish descent, try with absolutely no luck to learn an Irish jig, and sometimes even put on a “Kiss Me, I’m Irish” t-shirt (mostly just for the smooches from my husband!). But that’s all part of the fun. Like they say, “On St. Patrick’s Day, everybody’s Irish!” Well, this year I have been challenged to dig a little deeper. 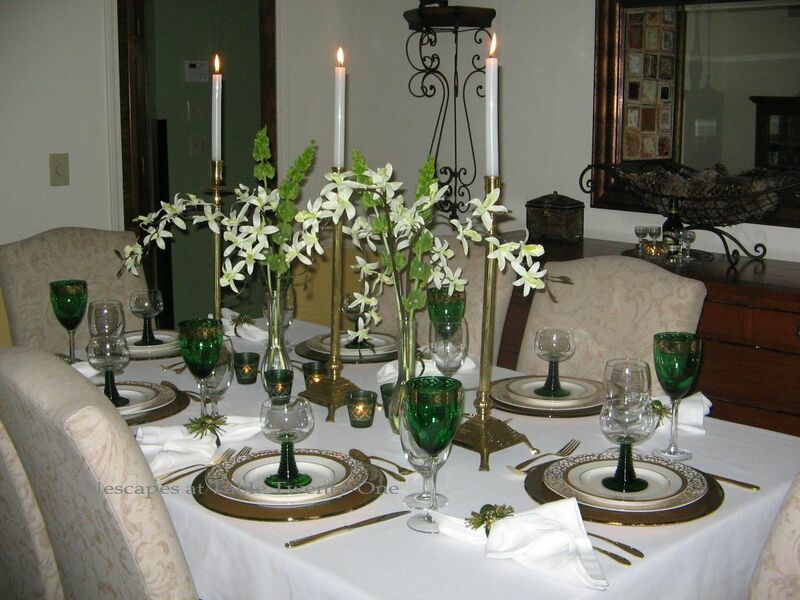 A lady who prefers to remain nameless here wrote to me via Facebook asking if I could help her with ideas for “an elegant, upscale St. Patrick’s Day dinner party.” Hmmmmm….elegant and St. Patrick’s Day. Not two terms you usually hear in the same sentence. Here’s the trick to it: Ms. Anonymous is of Irish descent and entertaining her non-Irish future in-laws at her home for the very first time. The in-laws, as I understand it, are a bit…shall we say…reserved. The mere mention of green beer would send them into a tailspin! So, the challenge was to come up with a table that could demonstrate pride in her heritage (after all, the futures did insist that the 17th was the only day they could meet for dinner while in town!) but still embrace the formality the occasion will demand. After nearly 10 days of wracking my little pea brain for ideas, my friend Jim Mooney – owner of Midwest Embroidery (who, by the way, is the most fabulous fabric guy in the world!) – randomly sent me an email with gorgeous images of the Emerald Isle. The photos took my breath away. Further, they inspired me – along with the hauntingly beautiful strains of Garth Brooks’s “Ireland” playing over and over – to create the tablescape that I hope will help Ms. Anonymous win points with her future in-laws. Thanks, Jim! And here we go! The mood is set for a lovely evening with festive traditional touches including the color that best represents the so-called Emerald Isle: emerald green, of course! When I think of Ireland and St. Patrick’s Day, I think of a lot of gold alongside the green. On a crisp, white linen I stacked a gold leafed glass charger and an American Atelier “Florentine Gold Scroll” dinner and salad plate. To top it off, emerald green-stemmed dessert bowls from Old Time Pottery. These Pier 1 wine glasses with clear stems supporting an emerald green bowl seemed a perfect representation of the occasion’s prevailing color. The gold design around the rim is similar to that around the china. I bought these stems at the same time I bought these that I used for one of my Mardi Gras tables this year. Starched white cotton napkins are closely hugged by these gold and green “Rock Spray” napkin rings from Pier 1. The center of the table is adorned with tall gold candlesticks alternated with simple free-flowing bouquets of Bells of Ireland and orchids. I considered pots of shamrock, but decided on this airy floral combination instead because of the height and tinge of sophistication it lends. Ms. Anonymous, you may want to go with slightly fuller arrangements since you are seating for 8 and have a larger table. My husband actually suggested that I use these emerald green votives in place of the gold mercury glass ones I had selected. Good goin’, Ramon! It really does work better! Your eye for this stuff is kinda starting to scare me, dude! 😉 I picked these votives up at Old Time Pottery last year. After dinner, I suggest a digestif of Bailey’s Irish Cream. It can be served in tiny glasses such as these, or in rocks glasses (Irish crystal, of course!) over ice. 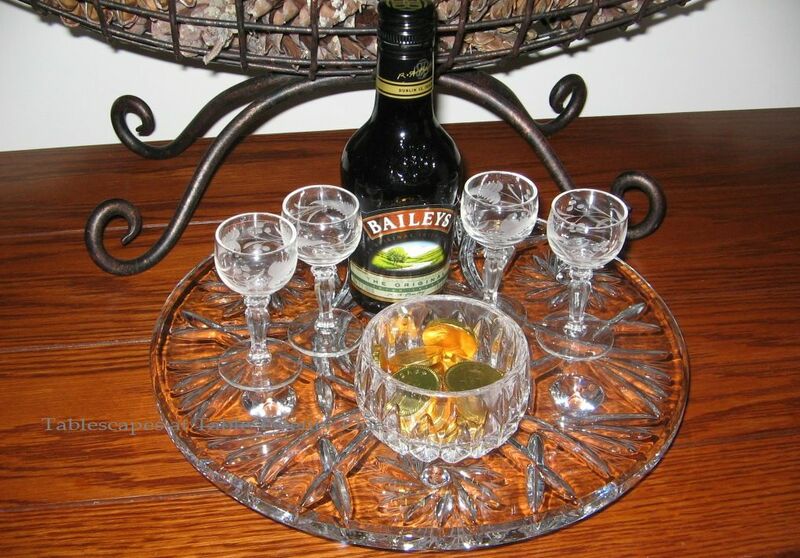 Single-serve bottles of Bailey’s adorned with a green ribbon make a great favor for each guest! OK….so this is my version of “Upscale Irish” for a St. Patrick’s Day dinner party. Ms. Anonymous, I hope you will be able to glean something useful from it, and I wish you much success with your dinner party! Thanks for the challenge…it was a doozy! I am joining Cuisine Kathleen’s St. Patrick’s Day Blog Crawl on March 15th. Just click the banner below to check out what some other very talented tablescapers are doing to celebrate the wearin’ o’ the green! ‘Cause we’re not waiting for the morn. We Were Forty Against Hundreds…..
I’m quite sure corned beef has never been served in such beauty. Thanks for sharing another of your awesome table scapes! May the luck of the Irish continue to grace you and inspire you. Hi, Amy! I was ESPECIALLY hoping you would see this tablescape!!! I thought about you when I was first approached to do it! Hey…Vernon’s back from Vegas. Can we try again for cocktails and your surprise. Plus, I’ve never seen the baby…who is probably headed off for college now! 🙂 Please send me some available dates via my private email. Thanks, and tell Bob hi for me! Hi Alycia! Love your sophisticated Irish table! Your green gobets & dessert bowls provide just the right touch of green. Bells of Ireland are one of my favorite flowers anytime of year, but are perfect for an St. Paddy’s Day table…love them with your Orchids in your vases! Thanks, Mary! Y’know…I like Bells of Ireland a lot, too. I don’t know why I don’t use them more often. They’re the perfect color, fabulous texture, fun shape. I think I may just have to reevaluate the decor I planned for my Mom’s retirement celebration to include a few of those lovelies! Love how you so beautifully pulled this off! The table is absolutely beautiful. Love the dishes. Glassware. Silverware. It is like a very well composed piece of music. I can just hear when Irish eyes are smiling! Happy St pat’s to you and yours. Thank you so much, Marlis!!! You are too sweet! I have NEVER done a St. Patrick’s Day table. We always go to someone’s house or go out. It was frustrating at first trying to come up with a basic concept, but it was well worth it in the end. I just hope the lady for whom I created it is happy and able to run with it from here. Here’s hopin’! This is indeed a very beautiful and classy table setting. I love everything. Beautiful tablescape, Alycia! Just stunning. I love bells of Ireland flowers. My son and daughter-in-law had them in their wedding reception. centerpieces. Thank you for your well wishes for our newest grandson-to be! An absolutely gorgeous Saint Patrick’s Day table. Each and every element is fabulous. Happy Saint Patrick’s Day, Alycia! Just a beautiful post. Positively elegant. I love the idea of the nips tied with ribbon. I will tuck that idea away for another post! So elegant, so tasteful and so chic. Your table is just gorgeous and your guests will be delighted to dine with you on St Patricks Day, to be sure. Alycia – love your elegant table. Have a wonderful day! What a beautiful table you have set. I adore those goblets. Happy ST. Paddys Day. Lovely tablescape… love those tall candlesticks! Just gorgeous! 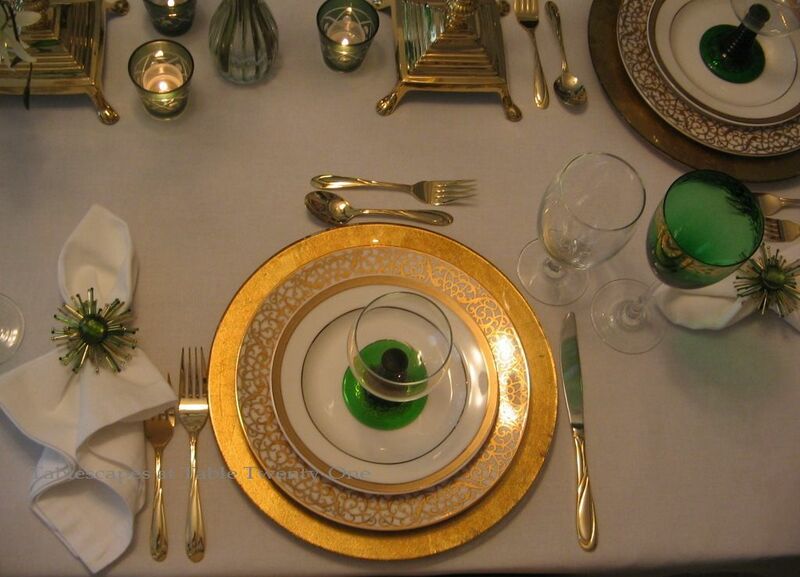 Your chargers, your gold plates and the salad plates and green glasses are just stunning. You really know how to pull a superb tablescape everytime, Alycia! So elegant! You’re welcome to come over my St. Patty’s tablescape too, would love to have you. I’m loving all the green…beautiful stemware and Bells of Ireland, one of my favorite flowers/plants. Thank you, Marigene! I really need to use Bells of Ireland more often in my arrangements. It’s so pretty and can be twisted into different shapes…it’s a great flower indeed! You definitely met the challenge! Your ‘scape looks very elegant and sophisticated while still lending a nod to the Irish holiday with the green accents! You’ve chosen the perfect flowers and the stemware is “right on” for St. Patrick’s! Thanks for your fun comments about my “Emerald Isle” kitchen island! You are a witty one! You did exactly what you were asked to do. It is elegant and festive for the holiday at the same time. The napkin rings are so fun, the stemware gorgeous and the china is so beautiful. Very nice. A, this table is just lovely! I think you nailed it! Thank you so much for taking part in the blog crawl, and so appreciate you joining in, and your friendship! I hope to get to Ireland one day too. I’ll take you home again, Kathleen…Oh wait! Kathleen is going back home in a box in that song! 🙂 They’ll play that at my funeral! Oh how I adore your Pier 1 wine glasses and the gold design around the rim! What a lovely tablesetting! Your husband has a good eye ;o) My eyes went immediately to the votives! Happy St. Paddy’s! This table is SO elegant! I would just die for those wine glasses. I think I’m really missing out on Pier One! Those candlesticks and chargers totally set the standard for this table! I hope you are outside enjoying this weather. I even took my tomato plants out for a bit. Geeze, I’m a real country squirrel! LOL! Hey, Debby! I didn’t know you could take tomato plants out this early. I guess so, though, if you’re just taking them out to sunbathe! 🙂 I’m going to get out there tomorrow and start putting in some of these violas and such. Say a prayer for the poor little things, ’cause I’m not the best at gardening! 🙂 Thanks for stopping by, and I’m glad you like the table! Pier 1 really does rock. I usually hit 2 or 3 of them in a single day to swoop up all the cool clearance stuff! Have a Happy St. Paddy’s day, too! What an elegant and beautiful IRISH table!!! Those green glasses are beautiful!! 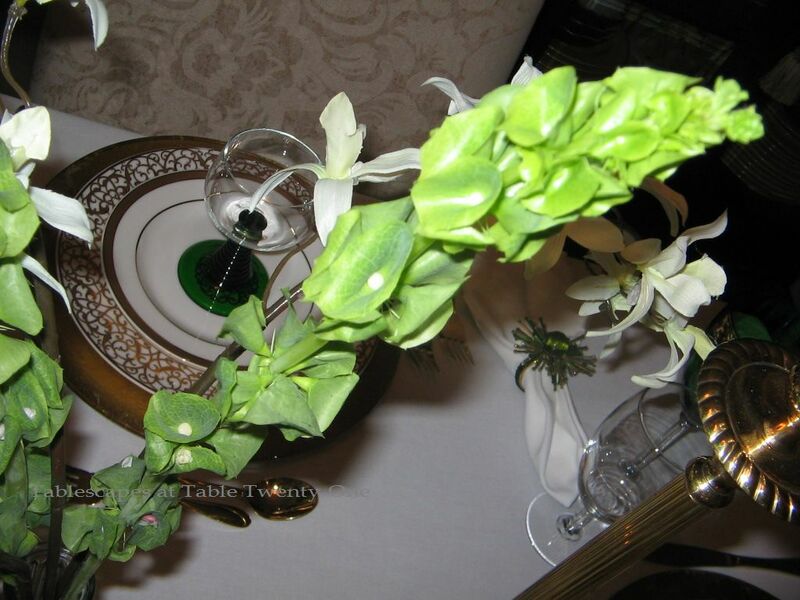 Wow this is gorgeous for Saint Patrick’s Day tablescape. Each and every element is fabulous. 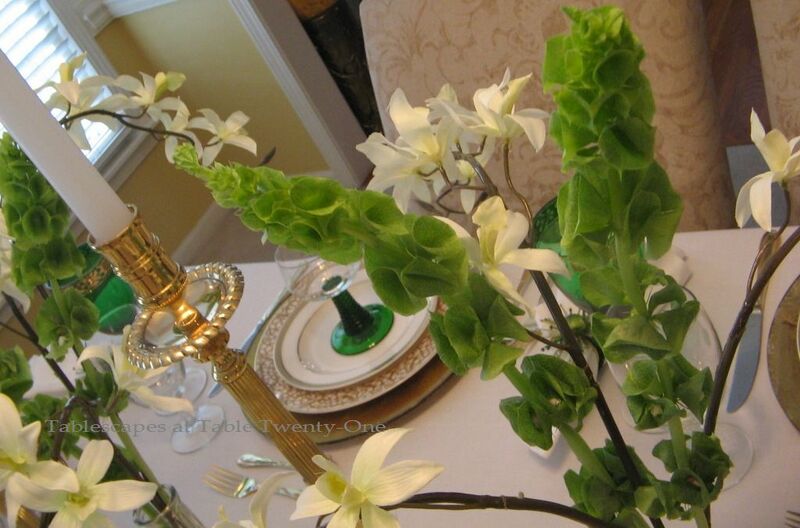 Thanks so much for your sweet comments on my Saint Patrick’s Day Tablescape love your napkin ring.. I hope you have a wonderful week with your family for St. Patrick’s Day Alycia! Oh my dear friend Alicya, I am a bit stunned that you’re not Irish…I’m not either you know, makes the two of us,lol! Your tablescape is fabulous and tremendously elegant, you always manage the touch of class in each table you set, pal. I’m loving your nap-rings and the etherial flower centerpieces. 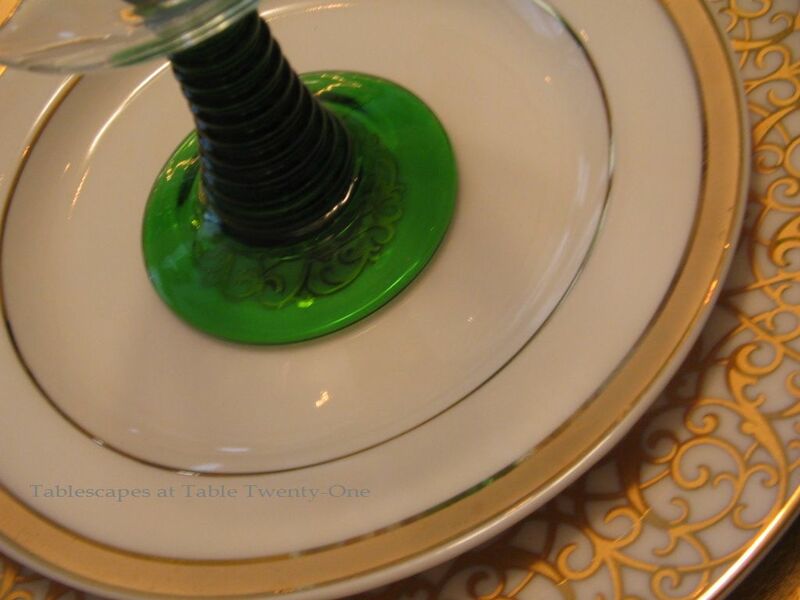 What a lovely, elegant tablescape to inspire so many of us on another St. Patrick’s Day. Thank you for sharing it! I have a set of Roemer wine glasses with the green stems too and will have to pull them out for dessert use now, how cute! Back again!!! I love this green with the gold. I love the green goblets with the gold trim, those Pier 1 napkin rings, that gold flatware and those beautiful “bells of Ireland!” Awesome in every way! Hope you have a great weekend! Wow…to think I almost missed your Irish table, being the gorgeousness it is!! I love the simple and etherial, in a way, centerpiece..totally love it!! The dishes, all the layers are gorgeous, with the gold chargers. Stunning! Happy St. Pat’s to all of us..weather we are Irish or not..hey, we’re Catholic, lol.. Have agreat week. Very nicely done. The stemware is TO DIE FOR. So pretty! Love it. Hope the winter lets up soon. So….in the meantime, I decided to see what you might do for St. Paddy’s Day. This tablescape is so simple and elegant. I especially love the green footed dessert dishes. Alycia…they scream Ireland to me. Love. Love. Love. I’m sure you’ll be setting a lovely table for you and your sweet Ramon tomorrow. The Luck ‘o the Irish to you. And God’s richest blessings be yours.